Some home brewed beers can develop a flavor and aroma of excessive alcohol. This can very from a slight alcoholic warmth to strong alcohol that tastes like moonshine. This week we’ll explore the root cause of an alcoholic off-flavor. During normal fermentation, yeast cells consume sugars and produce alcohol (ethanol) as a byproduct. 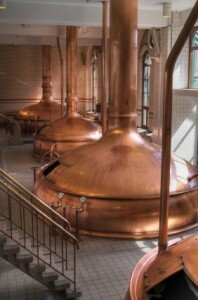 However, as fermentation temperatures rise yeast tend to produce higher order “fusel” alcohols in ever higher quantities. These include Isoamyl Alcohol, Propanol, Butanol and Isobutanol. These higher order alcohols are the ones that produce the warmth and moonshine flavors that are undesirable in beer. So the primary cause of excessive alcohol warmth is fermenting your yeast too warm. To avoid them you need to manage your fermentation temperature, taking into account that often the temperature inside the fermenter is as much as 10 F (5 C) higher than the surface temperature. Ideally you want to maintain the internal temperature within the range recommended for the yeast strain you are brewing with. A secondary, less common cause of excessive alcoholic warmth is having the proper malt balance and starting gravity. Some alcoholic warmth is common in very high gravity beers like barley wine simply due to the very high starting gravity and alcohol content. If you are working with high gravity beers and get excessive warmth consider brewing at a slightly lower starting gravity to reduce the final alcohol content. Also ensure you have the proper malt-hop balance as beers with high gravities need sufficient hops to offset the malt used. Fusel alcohols can also be created when we have extended contact between the beer and yeast cake. For this to happen, the beer needs to be contacting the yeast for a period of several months and not just a few weeks. Therefore if you plan to store your beer in the fermenter for a long period you should either rack it off to a secondary or use a conical fermenter so you can draw the excess yeast sediment off. Those are some tips to avoid creating a “moonshine” flavor in your finished beer. Thanks for joining me on the BeerSmith Home Brewing Blog. Be sure to sign up for my newsletter or my podcast (also on itunes…and youtube…and streaming radio station) for more great tips on homebrewing. Also check out the How to Brew Video series I shot with John Palmer if you want to learn more about all grain brewing. so you’re saying that if the thermometer stuck on the outside of my fermenter says 18ºC, the actual temperature inside is 23ºC? This is almost the upper temperature bound for most yeast strains. Should I then bring down the temperature until the thermometer says 13ºC? Without an internal sensor its difficult to tell, and the 10 degrees is in Farenheit, so likely you are only a few degrees higher in celsius, but yes you will see a higher temperature in the middle of the fermenter than on the surface. Hey there! I’ve been reading about off flavors in Beer. Recently I had problems with fusel alcohol… It’s there any chance to fix my finished batch? I’m not sure there is much you can do – they are generally cause by fermenting too warm and very hard to remove. The flavor may fade a bit over time if you let it age out.